Seasonic rigorously test all its products to ensure optimum quality and reliability before shipping them to customers. However in certain cases a product may not perform as expected when installed. It is important to thoroughly sort out the reason for a malfunction. Before initiating a warranty claim, please make sure that you have properly connected your Seasonic product according to the manufacturer’s instructions. Seasonic also suggest that you first consult your regional retailer, our Troubleshooting Guide and our technical support for possible technical assistance before starting an RMA procedure. What is covered by Seasonic's Warranty? What if I bought the power supply from another country? Can I transfer my warranty? How long is the warranty for replacement units? Is Proof of Purchase necessary? How do I start RMA? Should I start the RMA with Seasonic or my local shop? How does Product Registration affect my RMA? Where to send my RMA product? Should I include the accessories and cables in the RMA return? How do I package my shipment? Who is responsible for the shipping cost? Sea Sonic’s Warranty covers products against defects in materials or workmanship purchased from an authorized Seasonic retailer from the date of purchase. The product is returned to the point of purchase, postage prepaid. The customer is responsible for paying the costs of shipping when returning their product(s) to Seasonic. The product is used according to their intended usage, which is to power PC systems. Using the power supply for mining or powering any other electronic systems that are not personal computers will negate the warranty of the power supply. If the power supply is modified or used in an unusual ambient environment or in any other way that falls outside of the boundary of Intel’s current ATX specification – including cooling requirements, connector configuration and pertinent electrical and signal timing specifications, the warranty might be void. Seasonic strongly advises its customers to use the cables that are provided in the packaging box of the power supply. Third-party cables might alter the workings and the safety of the power supply. Please stay tuned for the upcoming special mining cables. For more information of cables and connectors, please visit the Cable Configuration page. The product was not damaged due to normal wear and tear or acts of nature, such as lightning, flood or fire. The product’s cover was never removed and the warranty stickers were not broken. The product was not purchased on eBay or similar marketplaces. The customer is responsible for paying the costs of shipping when returning their product(s) to Seasonic. In certain special situations (e.g., cross-border purchases) customers have to first contact their reseller (shop) or distributor for support. Seasonic offers transferable warranty for new purchases made on or after September 1, 2012 as long as the product is in its original factory condition and retains all the original factory labels and stickers. If you purchased your power supply prior to this date, and you are not the original owner of the unit, please contact our customer services. The transfer of warranty will not alter the original length of warranty available for the product in its geographic region. The new owner will be requested to present the initial (original) purchase receipt to apply for Seasonic’s RMA services. The warranty period commences on the Date of Purchase and its length is defined by the specific model. Please refer to the table below for the warranty period of each model. Any replaced or repaired product is covered by warranty for either the remainder of the initial warranty period or for ninety (90) days counted from the date of the replacement, depending on which one is longer. Since Warranty Periods may vary depending upon geographic region and product type, it is the responsibility of the consumer to check the exact Warranty Period that is printed on the carton. If you are living in a country where the point of sales entity grants a shorter warranty period than what is stated in the Seasonic Worldwide Warranty Policy or what is printed on the packaging carton of your product, Seasonic will always grant you the longer period of time. According to the European Union Directive 1999/44/EC, resellers in Europe have to provide warranty for a minimum period of two years on the products they sell. The full product Warranty Period is provided for Consumer purchases only; Seasonic retail products purchased by Non-Consumer entities are not subject to the same Warranty Period that is indicated on the product carton and they may not fall under the Seasonic Worldwide Warranty Policy. If you have misplaced or lost the Proof of Purchase, please contact Seasonic directly via our Contact Form or Chat support. Warranty claims should be initiated through your regional retailer. Should this not be possible then you will need to submit your claim online directly through our website’s RMA link. Please see more details below. Note: Your regional reseller is not obligated to provide guarantee beyond the minimum requirement of the local regulations. However, your local reseller may offer additional guarantee based on their own policy. If you need additional assistance, please contact Seasonic support. A valid Proof of Purchase is required for RMA processing. Submit an RMA application via our online RMA link after reading the RMA policy. Note: Please check your spam folder regularly. If you do not recieve a confirmation email within 20 minutes, contact our support. After submitting your RMA claim you will be issued a unique RMA number. DO NOT send the product to Seasonic prior to receiving the specific instructions. You will receive instructions by email on how and where to return your Seasonic product. Please use the original packaging material or the Seasonic approved packaging to pack the product for return. If the original packaging is not available, the returned product has to be securely packed so it will not get damaged during shipping. Seasonic cannot be held responsible for transportation damages incurred during shipping to our RMA receiving centers. Packages that arrive severely damaged may be returned to you at the your expense. Include all necessary documentation with your sending, including the printed copy of the email that you have received from Seasonic that shows your approved application. Write your RMA number on the outside of the box in bold letters. Packages that arrive at our collection center without the clear marking of a valid RMA number may be returned to you at your own expense. Use a traceable carrier for transport or a signed for service that provides you with a tracking number and proof of delivery. Once the return product is recieved, it will be tested and Seasonic service center will send a replacement unit to you. It is the Customer’s responsibility to provide Seasonic their correct mailing address and to make sure that there is an authorized person at the destination to receive the replacement sent by Seasonic. If a product was undeliverable and it is returned to Seasonic, the Customer will be responsible to pay the costs of re-shipping. If there are any other additional costs for re-directing or re-shipping the sending, the Customer will be responsible to coordinate with the carrier and to pay these additional costs as well. Seasonic is not responsible for packages lost or delivered to an outdated address. If you are in doubt, you should always contact Seasonic beforehand to avoid extra shipping charges. Product registration does not affect the warranty and its terms. A valid proof of purchase is required to initiate the warranty process even when the product is registered. Registering via the Seasonic Product Registration Portal allows you to store the proof of purchase of your product directly in the Seasonic database should you need the document to invoke the product warranty in the future. Learn more about Product Registration. You may be required to include all the original power supply cables with your delivery; this varies depending on the geographic area. Please follow the instructions in the e-mail update. FOR NORTH / CENTRAL / SOUTH AMERICA regions only: Please DO NOT send any cables or accessories (AC, DC cables, adapter, bags, etc.) with your power supply delivery for RMA processing. You are advised to select a return shipping method that provides tracking information. You can share the tracking information on your personalized RMA status page to inform Seasonic Service Center of your shipment. Seasonic cannot be held responsible for lost packages. If you have any questions, the fastest and most efficient way to contact the Seasonic Technical Support Team is by sending an email, by filling out our Contact Form or via Chat Support. If you have obtained an RMA number, please be sure to let our support team know when you contact us so we can better assist you. If you have any questions, the fastest and most efficient way to contact the Seasonic Technical Support Team is by sending an email, by filling out our Contact Form or via Chat Support. 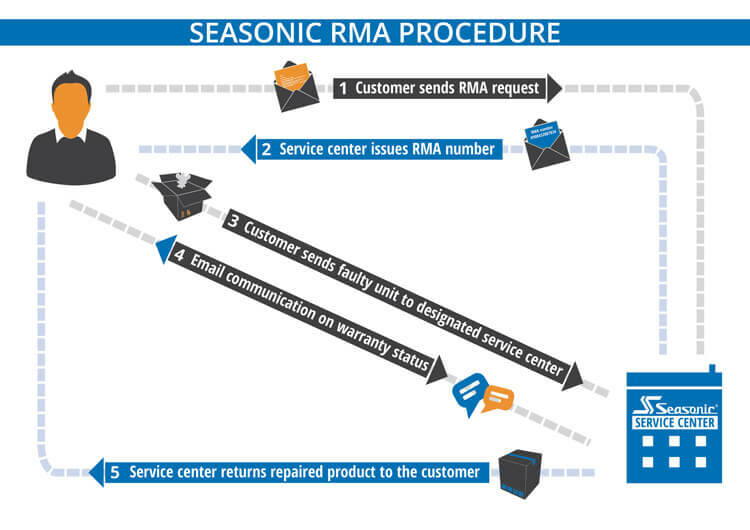 The Seasonic online RMA procedure is currently available in selected countries only. For customers from unsupported countries, please contact your local distributor; your application via the RMA Online Application Form will be rejected. We apologize for the inconvenience. All efforts have been made to ensure accuracy of all information provided on this website. Sea Sonic assumes no liability, expressed or implied, for any damage(s) occurring to your system’s components as a result of any mistake or omission during power supply installation or removal, or due to any defect or failure of the product. Sea Sonic assumes no liability, expressed or implied, for the use of this product or for any incidental damage(s) caused by the use of this product to other devices in a computer due to the failure of the product. In the event of any conflict or discrepency between the translated version of this warranty, the English version will at all times prevail and take precedence.